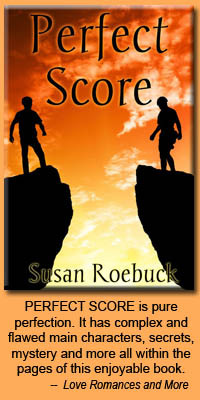 Susan Roebuck: Wowza - What can I say, except THIS is a review. Wowza - What can I say, except THIS is a review. I'm off again. But I'm just blown away by such a professional review. I know it's about my book, but it is just so well analyzed, spot on in every sense. It came from Speak its Name Reviews. I am going to enthuse. This–I know from people who complain that I’m too critical–is a rare thing, but I was so impressed by this debut novel I can’t not. It’s not perfect–and I can’t give it five stars for reasons I’ll explain later, but I’ll say right out that I consider it a must read and it has my highest recommendation. I will discuss plot points, so beware of spoilers. The story hangs on either side of the Speak Its Name cut off of Stonewall. It starts in 1963 and goes on for twenty or so years. It’s easy to get tripped up on “remembered history.” From experience I’ve found that writing recent history can be a lot harder than writing about several hundred years ago. It’s easy to take stereotypes and run with them, overdo the slang and the product references. Despite a teenaged Alex being full of “cool slang” in the first chapter, it doesn’t wallow in nostalgia and product placement. It’s absolutely not an m/m novel. And for a debut novel this is very, very impressive writing. Don’t make the mistake that “literary” means “I don’t understand a bloody word of this.” It’s readable without being coy or self-indulgent and you’ll be sucked in from the first chapter. The homosexual aspect–whilst actually being the core of the book isn’t the theme. It’s a love story, and the gender of the people involved doesn’t matter as much as the twisting and sometimes heart wrenching path they make while managing to not be together for one reason or another. The story is told in three points of view. Alex’s story is in first person, Sam’s is in third, and there’s a final three chapter epilogue in first person by another character that I won’t list here. Don’t be put off by the rather literary device of mixing and matching the points of view–it works and it couldn’t work any other way. Alex’s mind is bright and colourful, full of self-indulgence, a selfish, rather spoiled young man who thinks more of himself than he has any right to be, and it’s his maturation that winds around the plot as he learns to care about other people instead of satisfying his own needs. Sam however is considered a “retard” — dyslexia was not as well-known a disorder as it is today, and anyone hearing his speak or seeing the way he interacts with the world would have thought he was educationally sub-normal. To have written his point of view in first person would have tripped this book up, and I think the readers would have been impatient with the way Sam stumbled over the words, even in his head. Doing it in third cushions the reader a little–just enough–from this mental and vocal confusion. What wasn’t really needed then, in my opinion, was to be told at the beginning of each chapter, which young man it referred to–as only a few words in would have made it clear. There’s a lot of layers to this book too. It’s not at all just a case of boy meets boy, boy loses boy, boy finds boy–but then I’ve already said it’s not a romance. (not a tragedy either, but that’s all I will say about the ending.) As the blurb suggests there’s a hell of a lot going on even without the tortuous way the young men never seem to catch a break. Even for a full-sized novel, it covers a lot of ground, has a lot of plot and I loved that, it really gave me plenty to get my teeth into. What also impressed me was the sheer scale of the research involved. Not only does the history feel right–and that’s some doing in an era that went from the Beatles to the Space Age and into our technological era–but there’s dyslexia, chemistry, biochemistry, farming, mining, popular music and so much more, and if there was a bum note anywhere, I didn’t spot it. There were a few–very few–typos here and there, but not enough to pull me out. The ending–well, I absolutely don’t want to spoil, but I am pretty sure that (unless you are rabid about the falling into the arms and the HEA) you won’t be disappointed. The real kicker comes half way through the epilogue, which had me sobbing like a baby. I was railing at the end of the book proper and hating what had happened, but the explanation of the ending, and the way that it was concluded at the “proper” end was entirely right, and said buckets about the characterisation of Sam and the real coming of age of Alex. There aren’t many books in this genre of ours that have me mulling over them after I’ve closed the book but this really got under my skin and it’s been eating away at me in the same way that “The Catch Trap” or “Brokeback Mountain” did. Don’t miss this, because you’ll miss a real treat. I can’t imagine what Ms Roebuck will come up with next, but I’ll be first in line. Wowza is right. Way to go. This will now go on my "must read" list. Oooh, Karen, that'd be so good. You must be flying high after such a terrific review. What a great feeling to know someone loved what you wrote! Nice review. Thanks Donna, Alex and L.G. It is a good feeling. Wow, fantastic review, you're right Sue! That is a great review. It sounds like a great book to read. Congrats! !